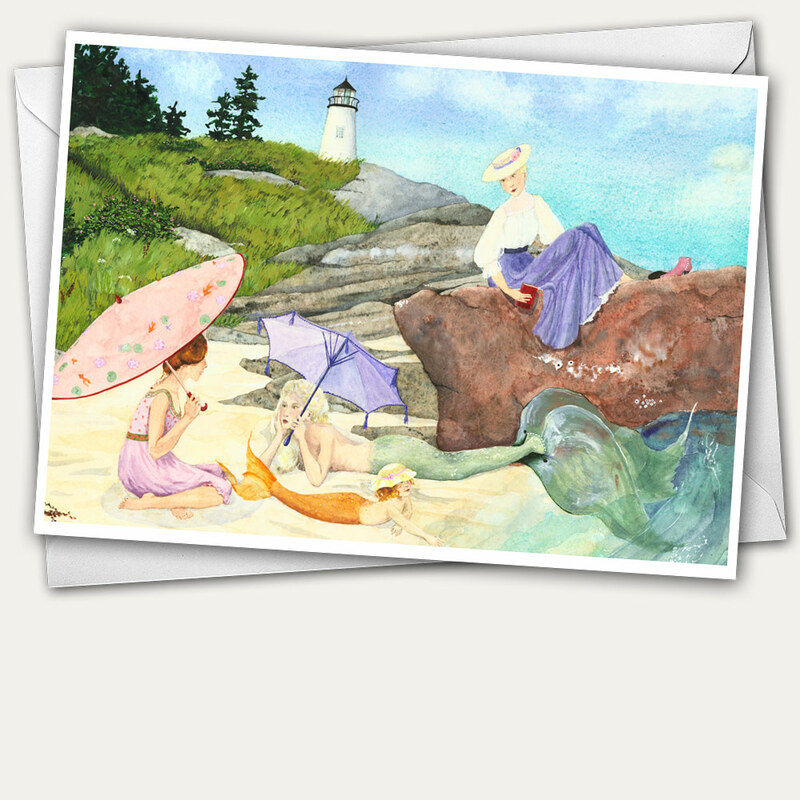 This Mermaid’s Cocktail Hour greeting card is the perfect memento of Hallowell, Maine – otherwise known as “The Little Easy.” Mermaids are a theme in Hallowell, notably in the famous Slates Restaurant. I paint mermaids here. And the bright adirondack chairs on the river are a popular destination for watching sturgeon jump, ospreys fish, and of course…mermaids. And then there’s the river, and the cocktail from one of our many funky bars and restaurants. 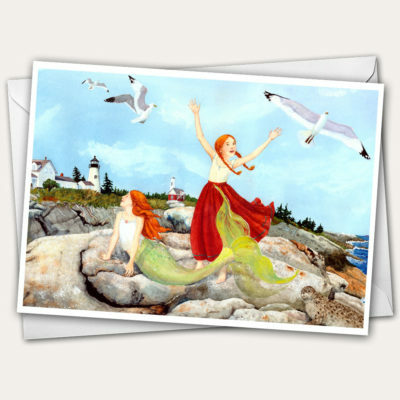 Before it was a Maine mermaid greeting card, “The Mermaid’s Cocktail Hour in Hallowell, Maine” was a small mural. I painted it for the Down With The Crown Mural Project. I wanted to do something really beautiful and eye catching. A mermaid, sitting in one of Hallowell’s brightly colored adirondack chairs on the public boardwalk by the Kennebec river was the idea that really sparked me. 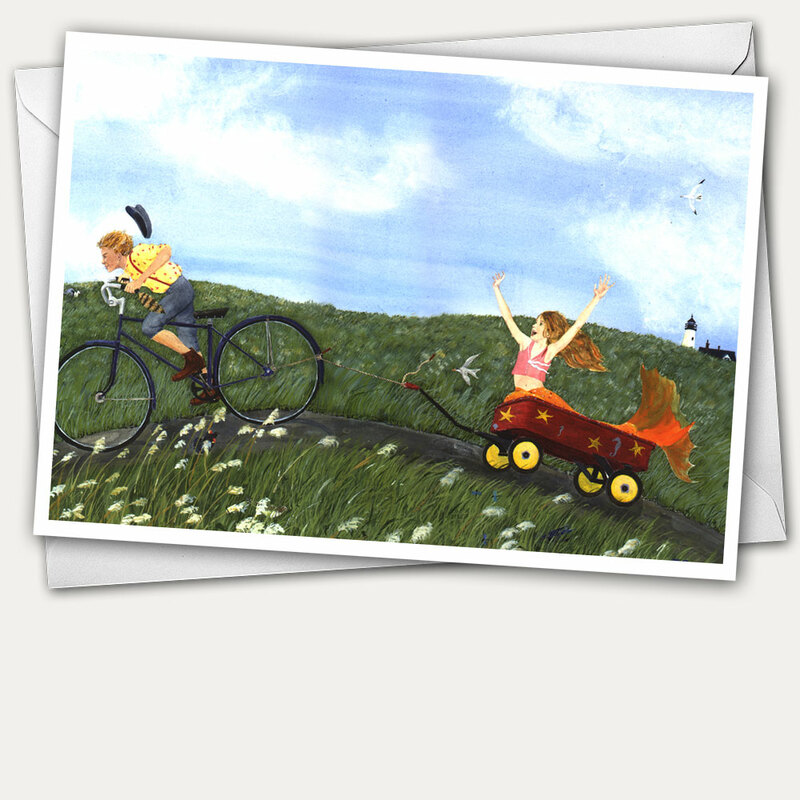 I had the perfect mermaid in my mind, but no model. Down at river to draw and photograph the chairs and the river and far bank that form the background for the mermaid mural, I looked to my left and saw an absolutely beautiful young woman walking her dog. She was the exact image of the mermaid I had in mind for The Mermaid’s Cocktail Hour! Such a strange coincidence surely was an opportunity not to be missed. I ran after her, hoping she wouldn’t be alarmed by this wild eyed woman with a camera and a sketchbook. Unfazed, she very kindly posed for me. The result was a sensual dream of a mermaid reveling in a fruity cocktail and the late afternoon sun. 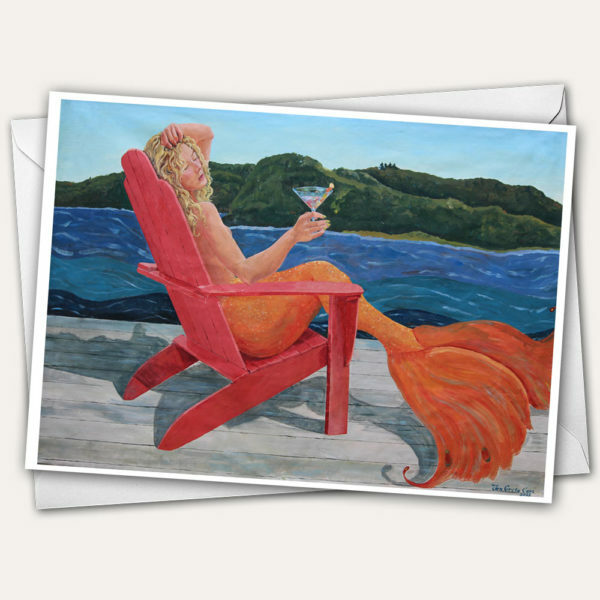 I hope you’ll send The Mermaid’s Cocktail Hour to a friend as an invitation for a drink, or keep it for yourself to remind you to enjoy a rest by the river in The Little Easy.